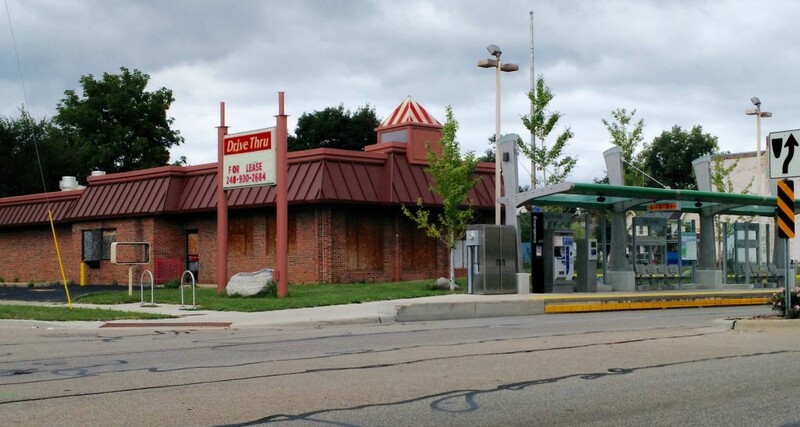 It’s been nearly a year since the $40 million Rapid Silver Line Bus Rapid Transit (BRT) line opened for business, so we thought it would be a good time to check up on how things are going. We review each of these items in this article. Wait, what? You thought ridership was increasing? One wouldn’t know it by reading The Rapid’s public proclamations. In fact, during the first few weeks of the Silver Line’s operation in August of 2014, The Rapid released statistics purportedly showing that ridership was increasing on both Bus Route 1, which largely overlaps the Silver Line’s route, and on the Silver Line itself. When one looks at the full picture, however, we see that riders mostly shifted from DASH service, the GRCC shuttle, and Route 1 to use the Silver Line. For instance, in September of 2014 the Silver Line had just under 60,000 riders. In the same month, the ridership on Route 1 dropped by 22,000 riders from September of 2013. The GRCC shuttle similarly dropped by 31,000 riders, and DASH South and West ridership dropped by over 5,000. This is exactly what we expected and pointed out our position in a Crain’s Detroit article in May of last year. Since the Silver Line route added nothing new to The Rapid’s services, we didn’t expect much of anything to happen. And that’s exactly what happened. Nothing. Even evidence that ridership is simply shifting from other routes to the Silver Line doesn’t tell the whole story. When The Rapid applied for funding from the federal government to cover the $40 million cost of constructing new permanent bus stops and purchasing buses, the system represented that the Silver Line would carry 7,200 average weekday riders and would attract 1,300 new daily riders to the system — all in its first year of operation. 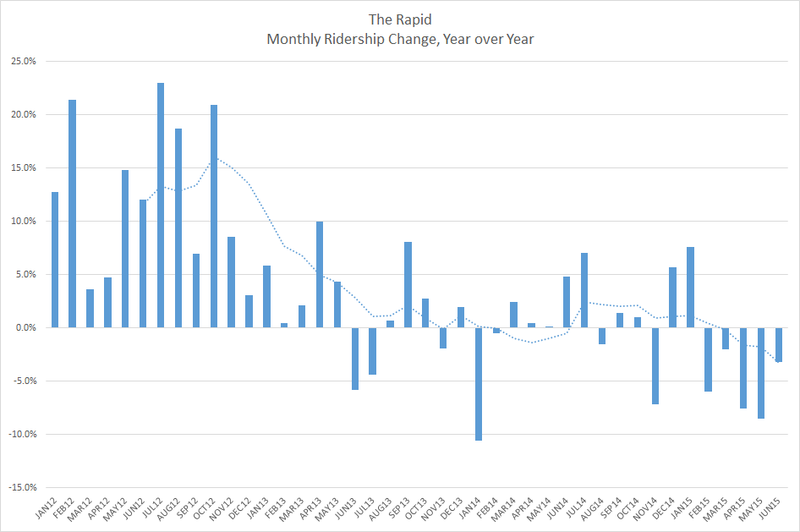 The trouble is that The Rapid’s overall ridership has declined, particularly in the last several months. In the most recent month where the data are available, the Silver Line’s ridership was approximately 3,000 per day, far from the 7,200 promised — and since The Rapid’s ridership is down overall, the number of new riders is in negative territory. All this adds up to the fact that the Silver Line hasn’t added any new ridership to the system, meaning that $40 million was spent for nothing at all. 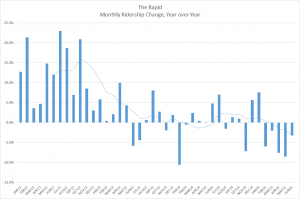 The significance of The Rapid’s failure to attract new riders becomes especially acute when one understands that The Rapid took on an additional $2.4 million operating expense to keep the Silver Line running on a daily basis. How do we know? In the same document that The Rapid sent to the federal government listing the expected number of riders, it also estimated the cost of operating the service. See here. Since The Rapid already operates Route 1, which largely duplicates the Silver Line’s route, the Silver Line essentially doubled the number of buses that are being operating along Division, but with no commensurate doubling in ticket revenue. In short, without any new riders, The Rapid simply increased its expenses by over $2 million for nothing. And now we see how this is causing a budget squeeze. The Rapid just announced that it is going to increase fares by $.25, from $1.50 to $1.75. On top of that, The Rapid is experiencing significant labor troubles for trying to convert employees to a defined-contribution retirement plan from a traditional defined-benefit plan. The Rapid’s leadership won’t admit it, but their prized Silver Line is causing a budget crunch because there are simply no new riders on the system to cover the additional cost. The primary benefit touted to justify building the Silver Line was the expected economic development it would cause. Indeed, when the Silver Line entered service last year, The Rapid’s CEO Peter Varga claimed, apparently unaware of the simplest economic fallacies, that when Cleveland opened up its bus route similar to the Silver Line, over $5 billion in new development occurred. Of course, anyone with a small amount of common sense would see right through such reasoning, but such stories were one of the major justifications for spending $40 million on the Silver Line. In fact, the claim was that Cleveland’s BRT caused over $5 billion in development over just six years. That’s $800 million a year. So far, a year after the Silver Line opened in Grand Rapids, the amount of development that it caused? $0. While downtown Grand Rapids explodes with new development, from the West Side up Michigan Street, virtually none of that development is on the Silver Line Route. And certainly no development is happening that otherwise would not have happened if it weren’t for the Silver Line, particularly since The Rapid’s ridership has been declining for nearly two years. In the meantime, South Division continues to stagnate. Indeed, even the Grand Rapids Business Journal’s editorial board jumped on the bandwagon and called the Silver Line’s impact “unprecedented.” But they seemed to miss the precedent that Orlando’s BRT route lost ridership while the surrounding area lost jobs. So much for buses causing economic development. But wait, there’s more. Now The Rapid wants to spend another $45 million — oh wait, nevermind, the price is now $64 million — on another BRT line for GVSU students. Since there has been zero benefit from the existing BRT line, perhaps The Rapid’s leadership needs to put the breaks on spending tens of millions more on a bus that, once again, only duplicates existing bus routes. August 26, 2015 in Latest Updates. ← Just how rapid will The Rapid’s new Bus Rapid Transit be?